Walmart to sell Monsanto GMO corn this summer. “Walmart is set to sell a new form of genetically-engineered (GE) sweet corn as early as this summer. Monsanto’s Bt sweet corn contains three GE traits that have never before been consumed directly by humans, and have not been subjected to thorough safety testing. There will be no labeling whatsoever indicating that the corn is a genetically modified organism.” Please read the entire article. CAVEAT EMPTOR!! 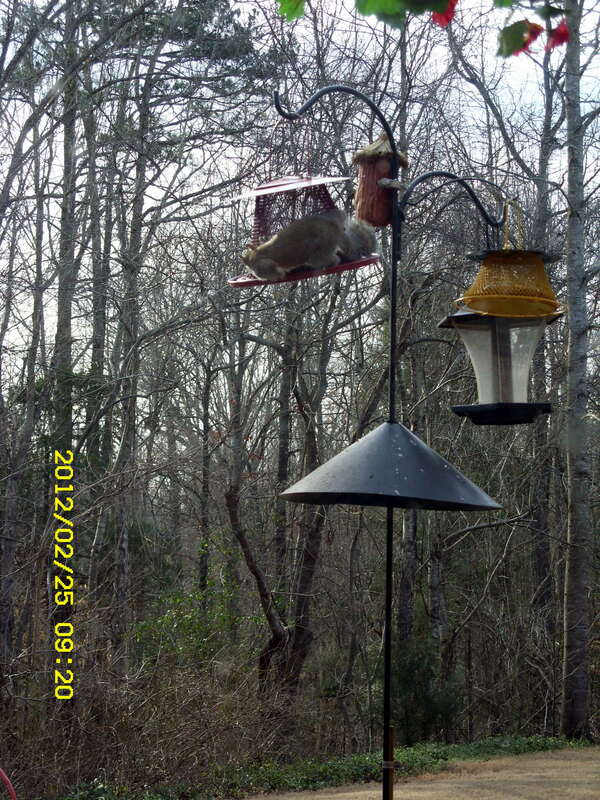 Squirrel insanity this morning!! 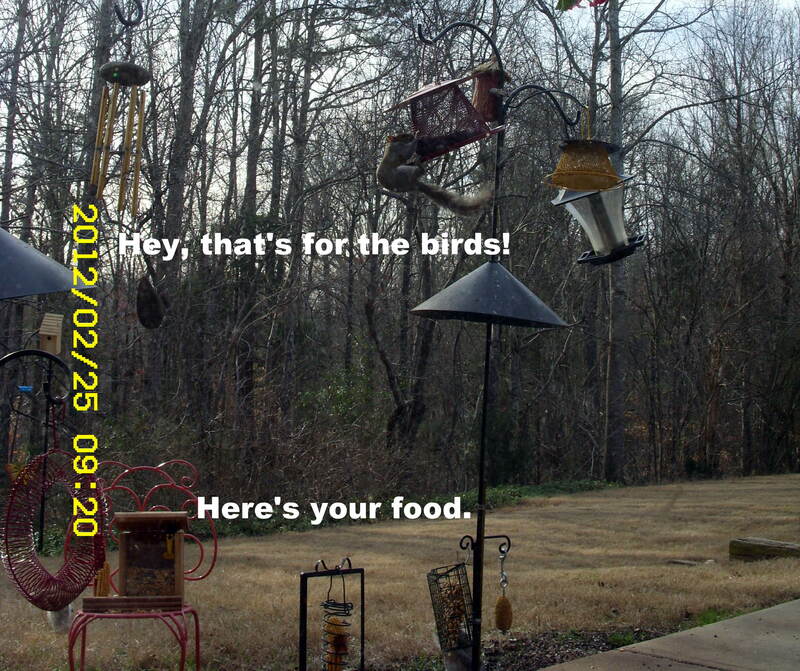 They are bold and brazen–and determined to get to sunflower seeds in feeders hanging from the eaves or shepherds hooks!! 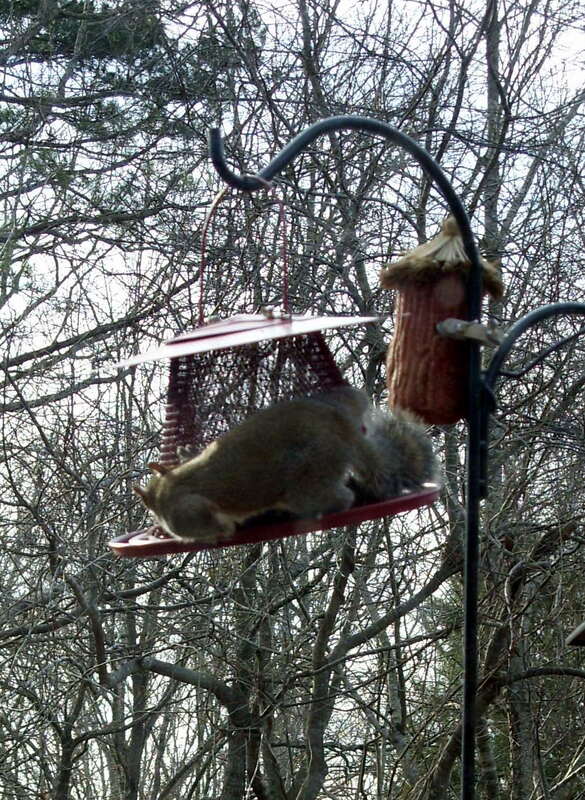 ~~ I think I need to upgrade my camera so I can take a video of the antics of the squirrels. 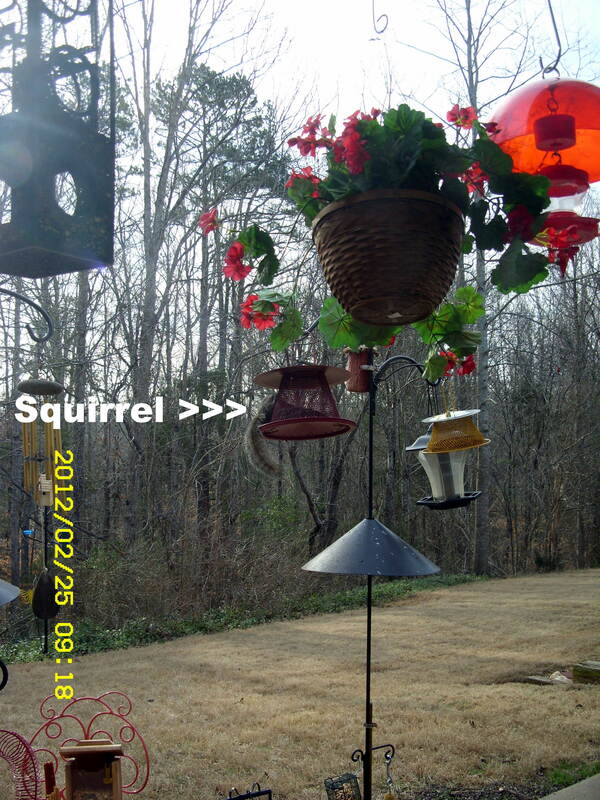 ~~ Sadly, this is a cold and windy day and I will be forced to work on projects indoors. 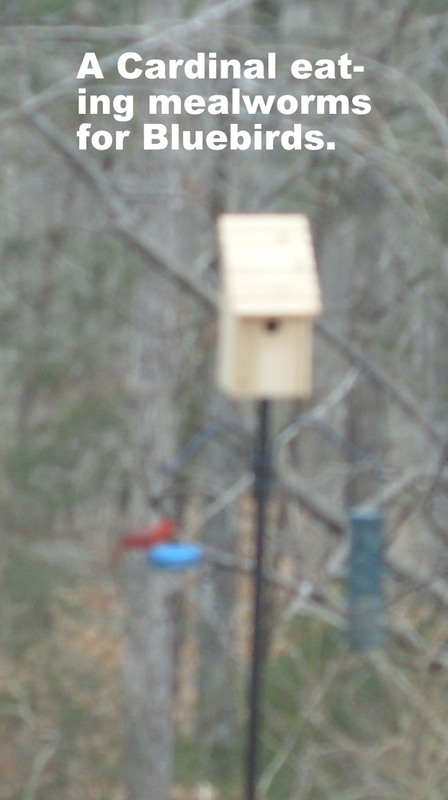 We had tornado warnings yesterday and the bluebird house withstood the wind. 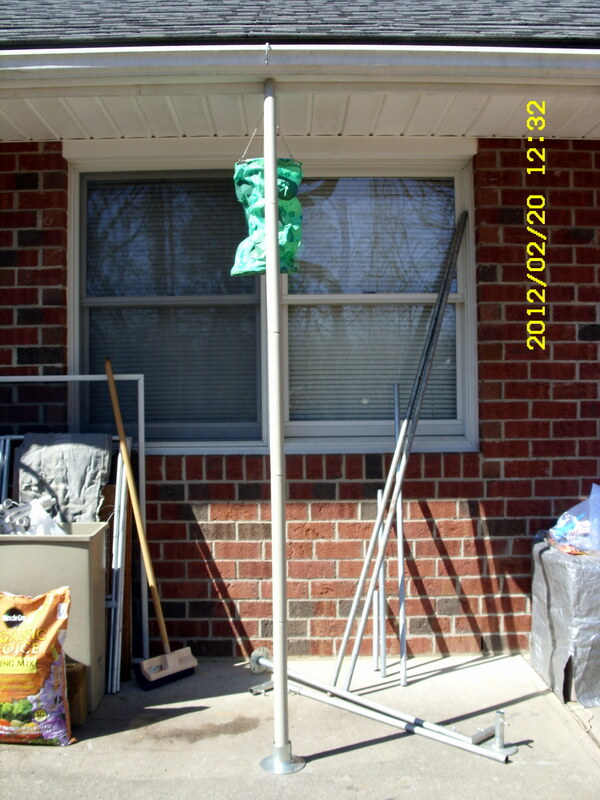 But I’ll stabilize that pole in the near future (when the weather is warmer). Note several more Goodwill purchases. 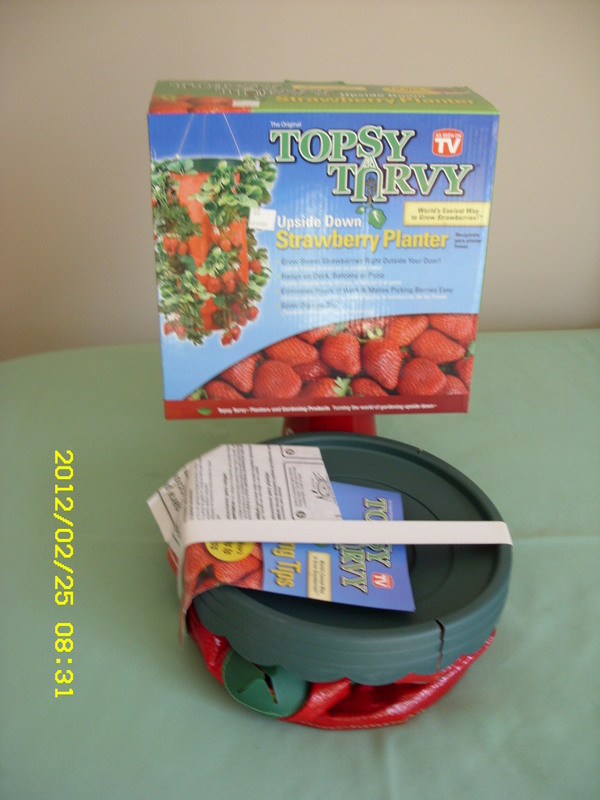 I couldn’t resist the Topsy-Turvy upside-down strawberry planter for 99 cents. Eleven reasons to stop eating dairy. I’m in so much pain, I am cross-eyed!! I’ve been going to a chiropractor and I am confident that I will eventually experience renewed health. But this weekend was miserable!!!! I couldn’t garner enough energy this Monday morning to drive twenty-plus miles for my appointment. I didn’t have the desire to take my dirty clothes to the nearby laundry room!! 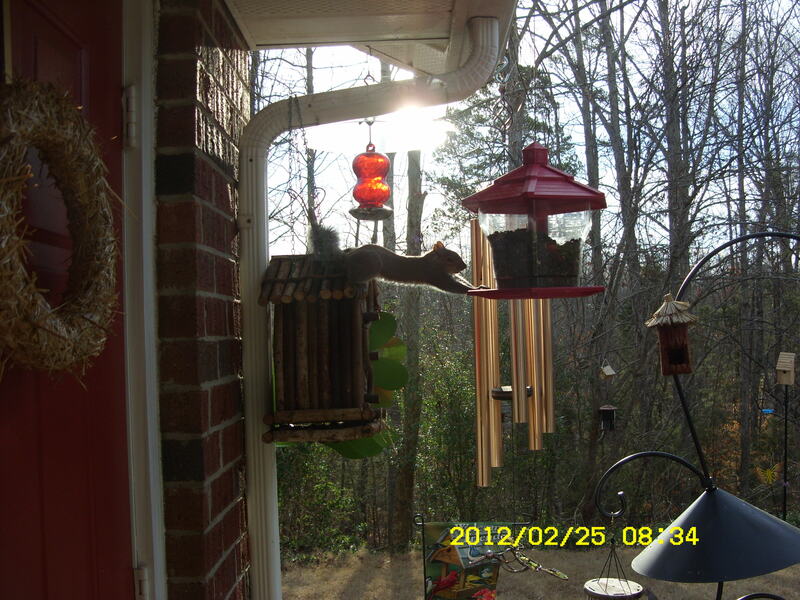 As the morning grew bright and sunny, and warm, I felt compelled to spend time on my patio. (When I am working on a manual labor project, I forget the pain.) 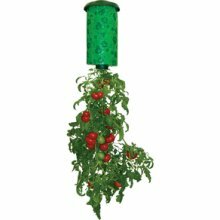 I evaluated the “stuff” I could use to support an upside-down tomato plant. I had a lot of odd “stuff” under a tarp… and I needed to spread the items to see what I could use. 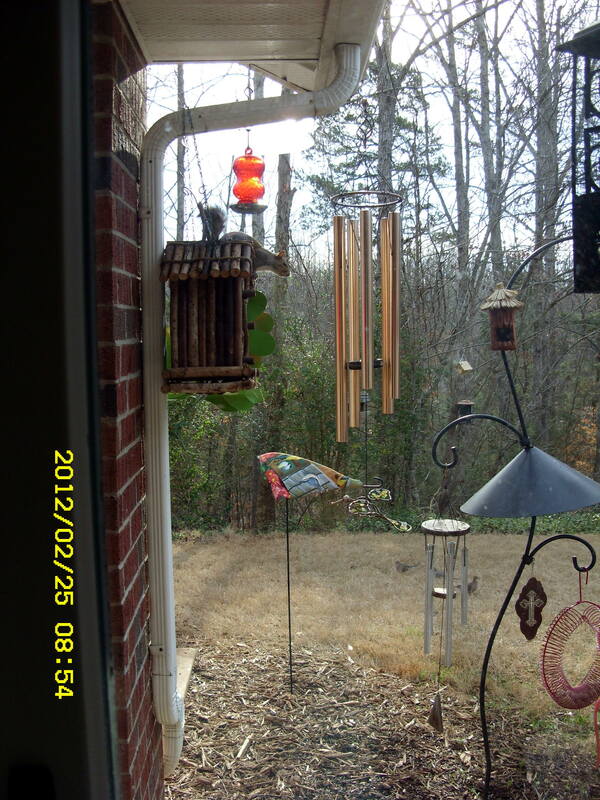 Change of plans: I could use those heavy-duty plastic pipes as a prop against the eave. 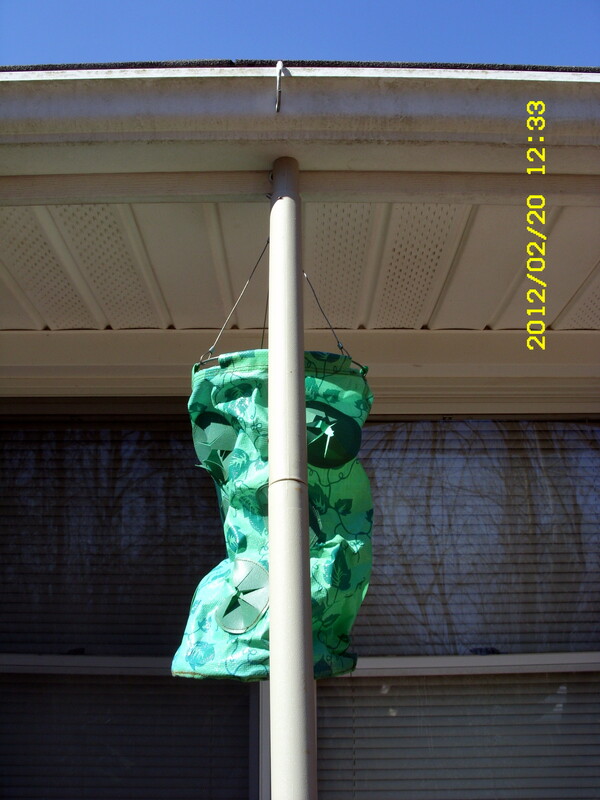 Actually, the upside-down container is attached to the pipe so there isn’t any weight on the eave. 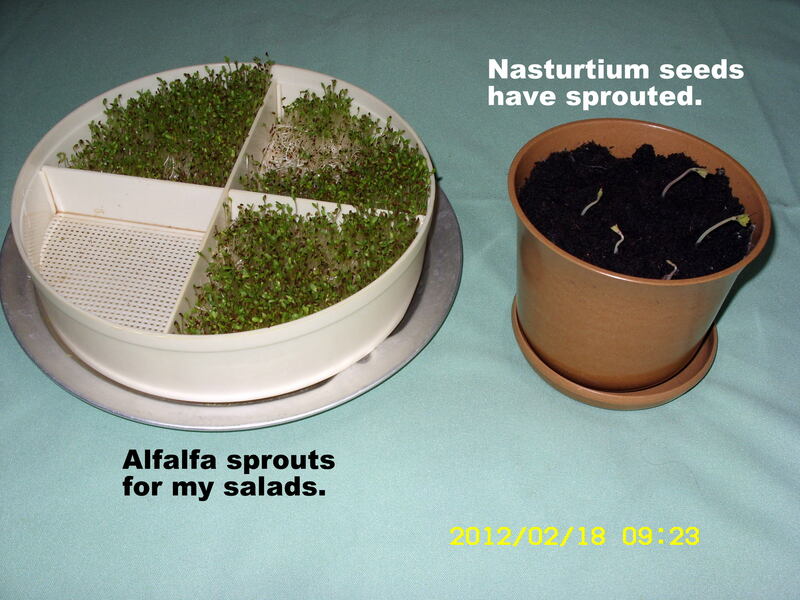 Well, there isn’t any “weight” right now because I have yet to put soil in the container. 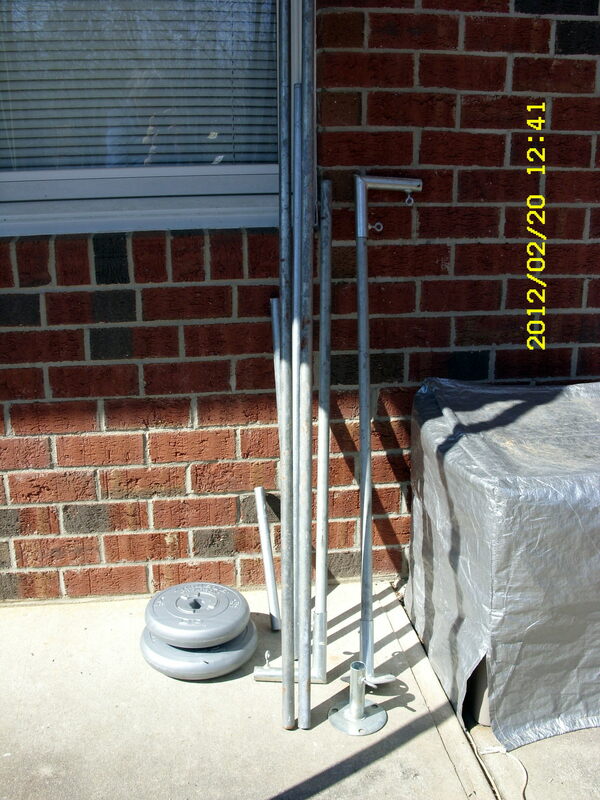 ~~ I still have that galvanized pipe for another (yet to be determined) project. Furthermore, I also have a lot of PVC pipe that might be useful. 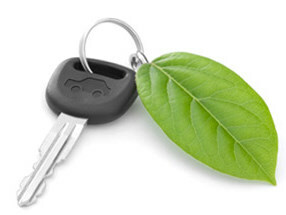 Postscript, Thursday, Feb. 23, 2012: Change of plans!! 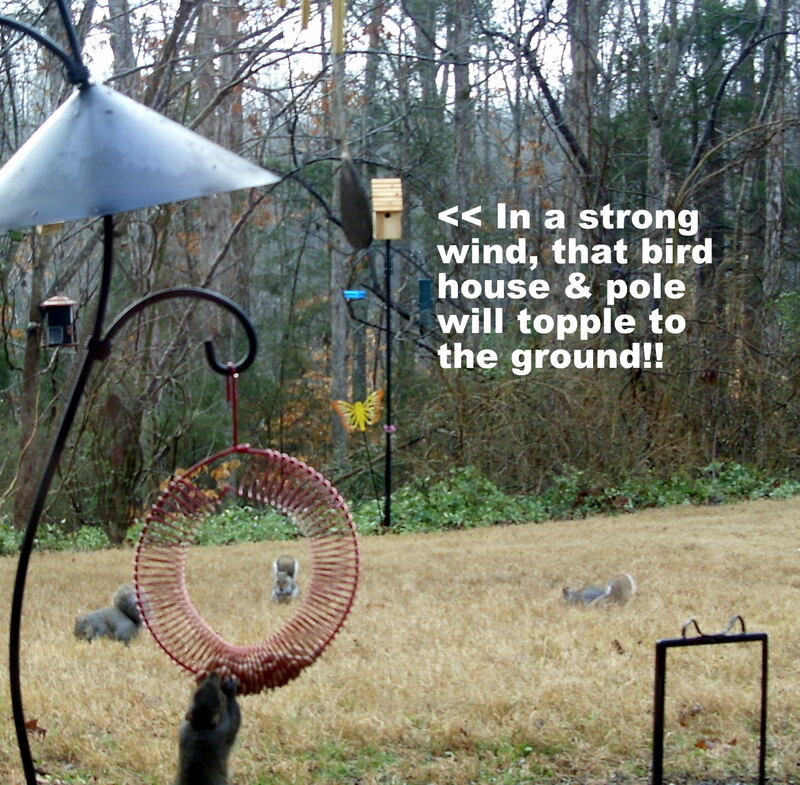 Now I think I will set the plastic poles in a large container of freshly prepared cement. Then I can move it around (if necessary). I don’t want to risk damaging the eave!! You’ve heard that old saying: “If life gives you lemons, make lemonade.” Today I made potato soup because “life” gave me a bag of potatoes with one-third rotten!! I just purchased that bag a few days ago–from Sam’s Club. Potatoes have been so-o-o-o expensive, I almost never buy in quantity. Now I know why those potatoes were reasonably priced. I’ve peeled potatoes until my wrist aches!! Later, when the soup cools, I’ll move from the big four-quart kettle to single-serving size containers–and freeze. It tastes delicious (IMHO)!! Simply potatoes, onions and garlic in vegetarian Better Than Bouillon. ~~ I love the smell of food prepared in my kitchen!! When I was traveling with my tiny teardrop trailer, I was deprived that luxury. The kitchen (in my T@B trailer) is extremely tiny and the refrigerator is small. There is a tiny freezer (big enough for a couple of ice-cube trays) but things (even ice) won’t freeze. 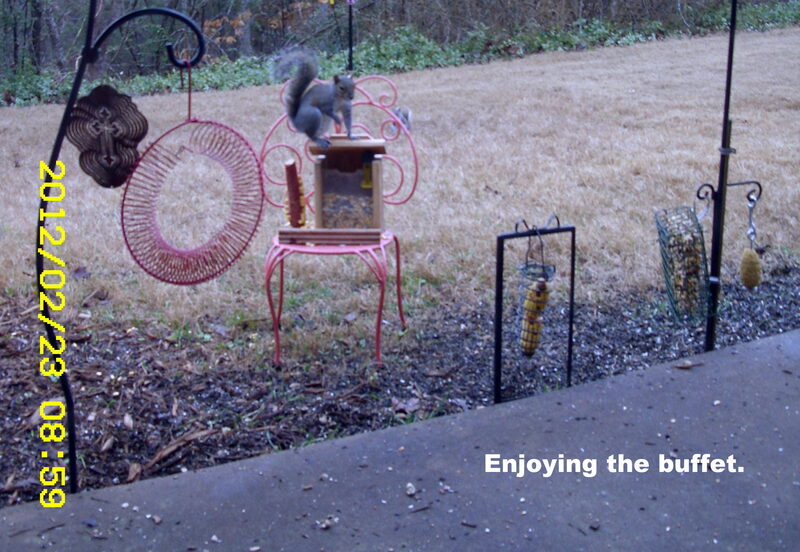 ~~ It is a dark, gloomy, rainy day so very nice to work in the kitchen. 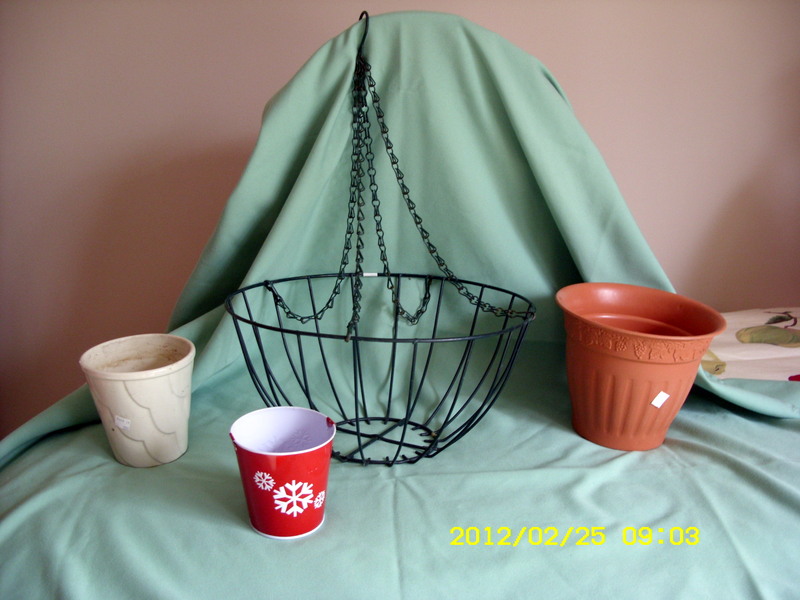 ‘Tis Saturday morning and I am puttering with my several favorite projects. 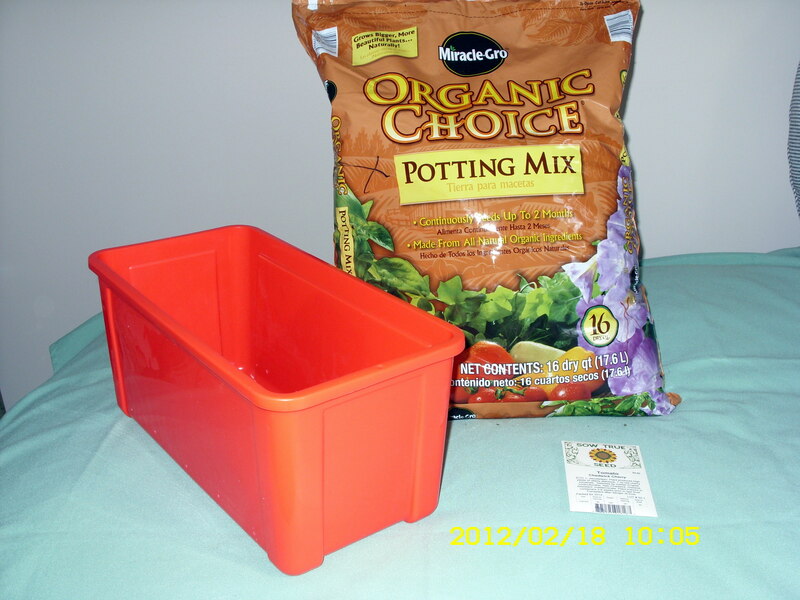 After I publish this blog, I will plant the tomato seeds in a Lego container (costing 99 cents from Goodwill–with [my] many holes drilled in the bottom). Have you noticed that I have a lot of items that are red?? 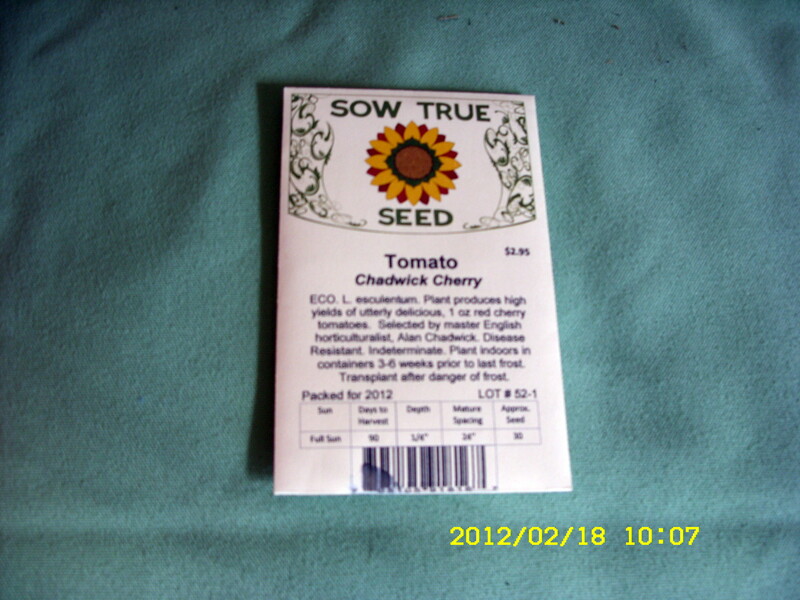 Later the tomato plants will be transplanted in an upside-down planter. 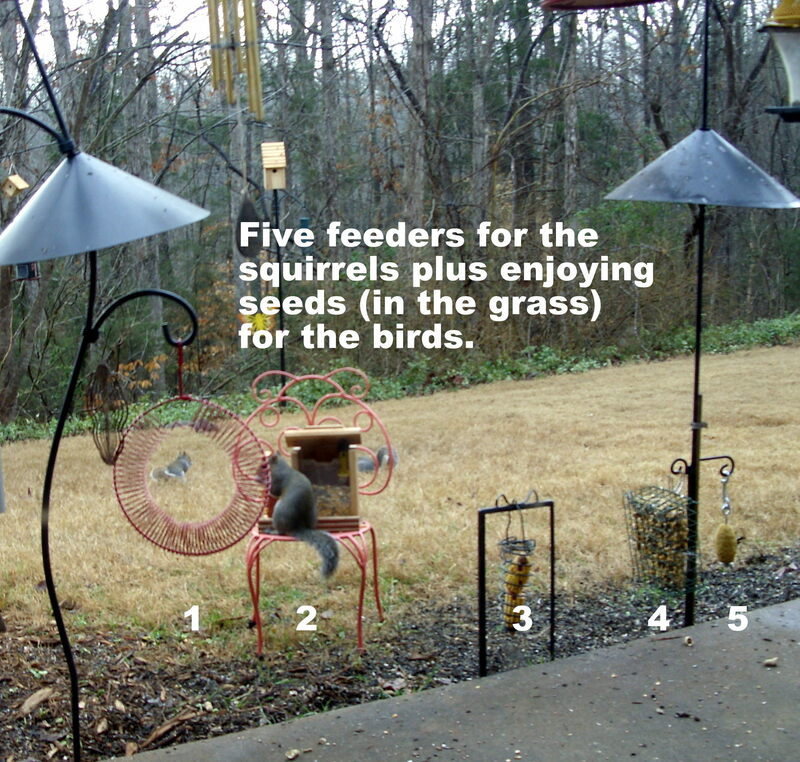 I tossed about one quart of bird seed in the grass, hung the whole peanut feeder (wreath) for the squirrels, rehydrated mealworms for the Bluebirds, and refilled sunflower seed feeders. 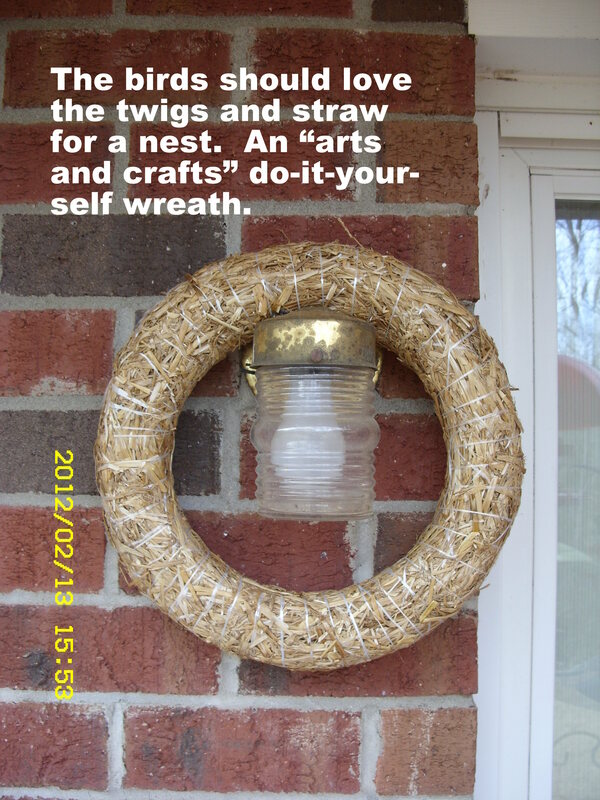 I recently moved the straw wreath from outside light fixture to the storage-room door. 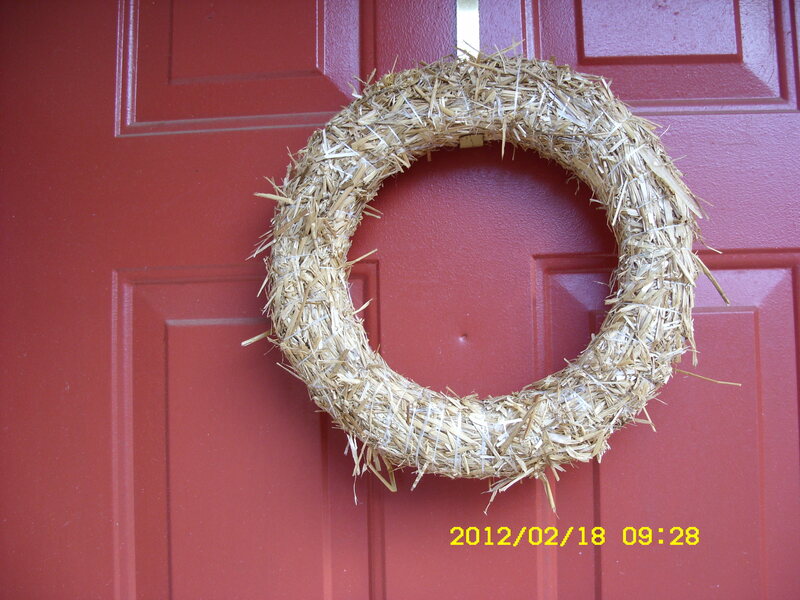 Look, the birds have already started pulling straw out!! Likewise they are pulling fabric and string from the other container. 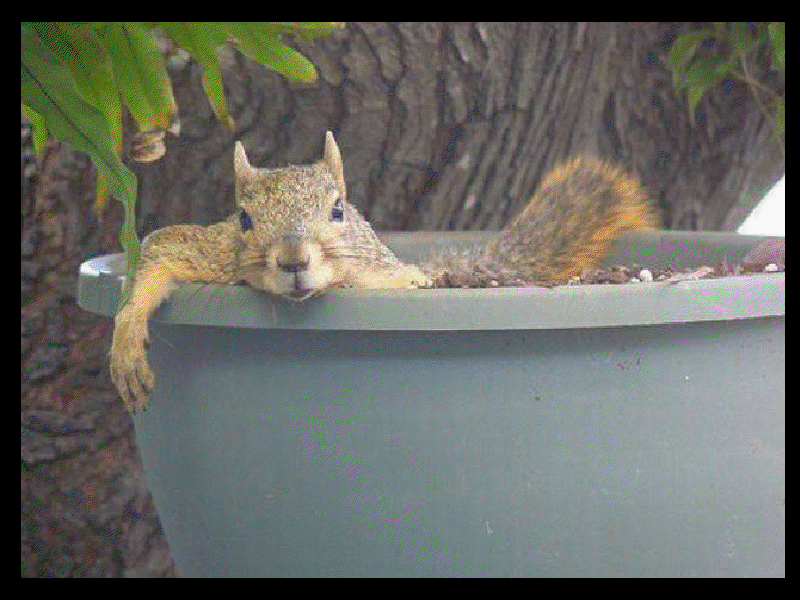 (My “critters” support my emotional health.) 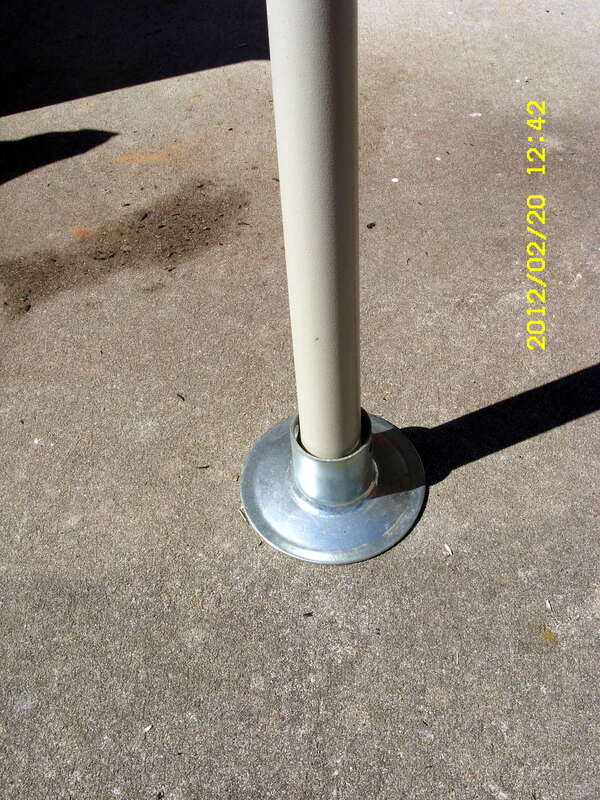 ~~ If it gets warm enough… I may spray paint the old wrought-iron posts. 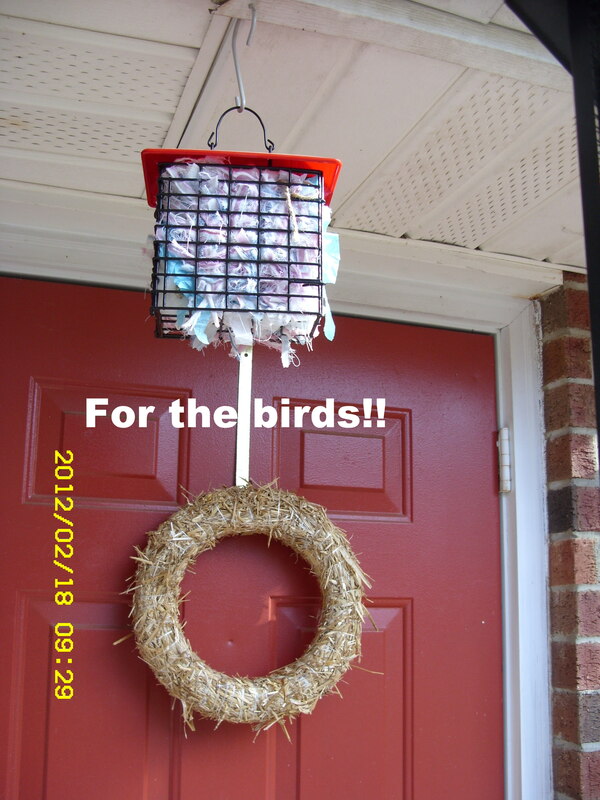 I’m so anxious for a really nice warm weekend so I can start positioning baskets in the trees for potential bird nests.